Can I Figure Out Why Countries Have Flags And How Some Got theirs? 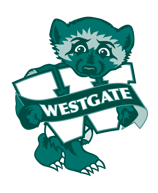 Due to a slight issue with weebly, my website was deleted so I didn't do a video. That the American flag has 50 stars and 13 alternating red and white stripes. Who designed the first design of the US flag. I will research how countries got their flags. That countries have flags as a symbol of pride and to bring people closer together. I will create a website showing several facts about country's flags. Who created the US army's flag. We know that making the hawk sculptor is going to be hard and it's amazing how the hawk can fly with a large body weight. 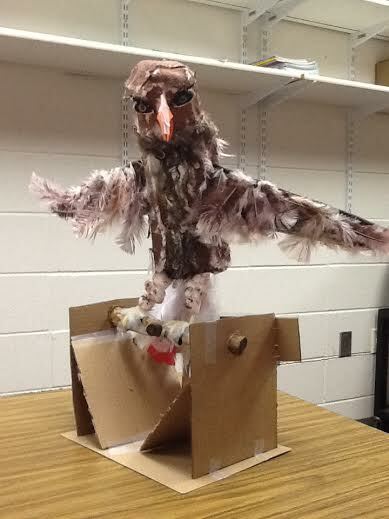 We want to know how the hawk can fly and how they can hold their own weight up in the air. We are going to try and find out by looking it up and then teaching other people how they fly. Me and Charlotte have learned a lot about how hawks and other birds fly, and we also learned how to work together in some ways. Me and Charlotte are going to post our video on Youtube and that video is going to teach people how birds fly. I have a question about how hawks can land? Is it like an airplane? Charlotte and me are very proud of what we made. It took us a long time, and we had to stay in a lot at recess. Up at the top of the page is a picture and video of our hawk and how they fly. Three other things that we learned was friendship, how to work together, and how hawks fly and there diet. To me, this project was very fun! Any teachers that are looking at this should really think about doing passion time with there kids! Drew and I are really proud of what we made as Drew said. I learned a lot about how hawks fly. It very hard to put the hawk together and we had a lot of mistakes but,it all turned out in the end.I love this project! After we were done some people said they thought that it wouldn't be good but it is. I hope that I can learn even more. 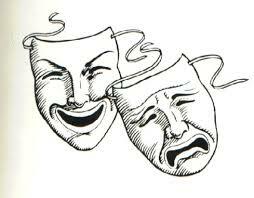 How can I teach others about acting? I'v learned how to teach others about acting. Should I make a Season 2? I LIKE to give credit to (mixed order.) Mr.Solarz,Metropolis,Youtube,and anyone who saw these episodes. I learned about vocal warmups I can use and a little more magic with youtube. Wait a minute? Is that Galactis? Devour of worlds?!?! Avengers Assemble!!! Round four has begun!!! This is my site. please visit my site, hear is the link! I know that all predators are suited for there environment but have flaws. How to make predators with no flaws at all! I will look at all of the top predators of that area, take out there flaws and combine them to make it super. I learned that there are reasons for why the predators who are at the top are at the top but none are perfect. I also learned that when you combine predators the predators you combine have to be close to perfect to make a perfect predator. Can this really happen in real life? could it kill people? would it really b ultimate? I think that I learned what life would be like if their was a predator that would be unstoppable. One that could stand up to anything including humans. I also learned that there are some set backs to cross breeding including birth defects like clef pallets and their are some other problems like heart deceases and early death. This was a really good for me to learn about something I enjoy and I learned a lot from it. 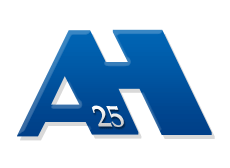 Click on the image to go to our website! We know that dogs are smart.We know that it is takes a lot of effort to train a dog. We want to know the steps to obedience training for a dog. I will find out how it works by websites and interviewing people who know all about our topic. We learned that it pretty much depends on your actions when it comes to training a dog. I will make a video to explain rather than to show. I will edit our website when good information comes up. What do dogs think of training? How do dogs know what we are saying? Who is smarter? A dog or a baby? Is how normal training different from seeing eye dog training? I am so glad I researched this topic for Passion Time. I learned things I would have never learned . I love dogs so much and it was fun learning how they become who the are, because of training. I really enjoyed being able to do this with Abby. It was nice because I always had someone to back my ideas off of, and someone to help me when something went wrong. I love dogs and all animals so I was really happy and excited when we thought of that topic. I was also really happy to be able to to my project with Emily, so it was a win-win. Researching about dogs was really fun (some of the fun was looking at cute pictures of puppies) and I think we were ahead most of the time because Emily and I work good together. I really wish I could work with Emily again and use that topic again. Oh well, it was fun while it lasted. If You Click On This Picture You Can Get To My Website! I know that Bulldogs don't live as long as other dog breeds. I know that Bulldogs have a lot of health problems. 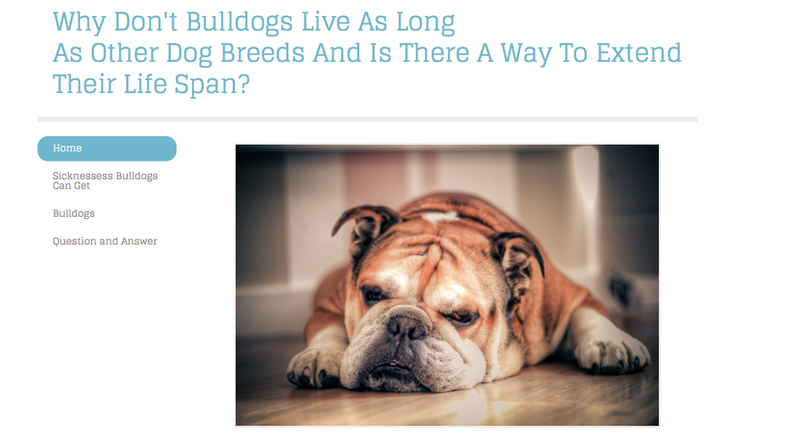 Why don't Bulldogs live as long as other dog breeds? What sicknesses can Bulldogs get? Do those sicknesses have to do anything with the amount of their life span? I will make a website explaining everything I learned. I learned that Bulldogs can't breathe very well because they have a lot of skin on their face. I learned that Bulldogs need exercise to keep them healthy. I learned that if they get to much exercise it makes it really hard to breathe. I hope that people learned about all of the sicknesses/diseases that a Bulldog can get because if they were wanting to get a Bulldog they would know to be careful and to not over exercise them. What causes them to have all of these sicknesses? Why do they have so much extra skin on their face? I think overall I learned a lot from this round of passion time. I learned about all of the sicknesses that a bulldog can get. I also learned that bulldogs don't breathe very well. I think this can be pretty helpful because I really want a bulldog so now I know to be careful around them. I enjoyed making my website because I really do LOVE dogs so I loved learning about them and especially seeing pictures of them. I didn't like learning about the sicknesses because some of them were a little disturbing and gross. But the other part of me felt really bad for them. For this project I liked working alone because it's easier to do and I got to do my own website and my own video the way I wanted. I find that sometimes if I work with a partner we disagree or I don't like the other person's ideas. But overall I enjoyed my project. Can I teach people how to use Scratch through a program on Khan Academy? By: Julia Z. Watch me as I talk about the program you can make on Scratch, and the program I did make on Khan Academy! I recommend full-screen. To get a better view, click the "Scratch How-to" link provided. Khan Academy can be used to make programs. There are other ways to make programs. Scratch is another way to make programs. What is different between the 2 websites? I will experiment with Scratch, and look at other people's programs to help me with my final Khan academy program. One of the things the 2 websites have in common is that the more complicated the code, the cooler the program. I will try to get my program public on Khan Academy, so tons of people can see it. How many different programming websites are there? Are there websites similar to the ones I used in this project? How many different types of code can I learn to use? I learned a lot about Scratch, and even some things about Khan Academy. Programming is the building blocks of all websites and apps (no pun intended), and it was kind of cool to learn about the different languages of programming. Programming is a world within a world. People speak different languages, and do different things sometimes, but it all comes together very well. How have Olympic swimsuits changed over time? By: Sam K.
Click on the image above to go to my website. That fast suits increase your speed and some of them were fast enough they got banned. Were fast suits faster now or back then. I will research and read books on the fast suits in swimming. I learned that one of the fastest suits was the lzr racer and in the 2008 Olympics 23 of 25 records were broke by swimmers wearing it. What was the lzr racer made of and how are they repelling water. The hardest part of the project was Finding out about why and how Fina banned the lzr racer. The easiest part was when I did my video I was not nervous because it was a screen cast. This passion time was awesome because i learned so much. Click on this picture to go onto my website! What are a lot of rides in Disney World? What was Walt's child life like? There are more than 100 rides in Disney World! Our website will give people information about Disney World so they can go on a vacation! Why was Mickey Mouse and his friends created? How did Walt Disney think of these amazing rides and water slides? We learned a lot about Disney World and a lot about Walt Disney. We learned all about how and why Walt Disney created Disney World. We also learned his background information like his family and when he died. We also learned about the water parks, rides, places to eat, and places to stay. We learned so much about Disney World! I really enjoyed this passion time project because it taught me about a place I really like that I did not know much about. I didn't know that there are so many fun rides to go on mare than 100 rides. And I thought that Walt Disney was just a man that made Disney but he has a very interesting life and story we learned so much in the 9 periods of passion time. 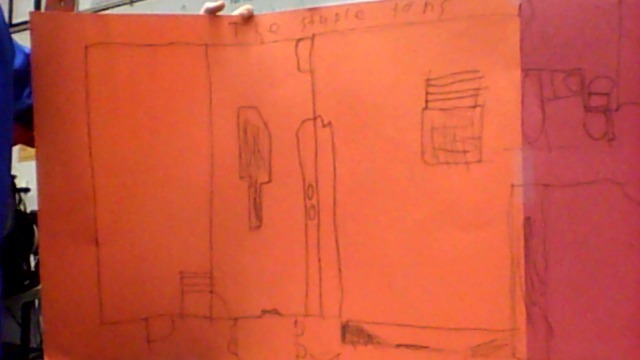 Can I make a floor plan of my house? By: Charlie St. I want to know what the architectural symbles are. I know that it is over 2800 years old. Has a furnace as it's light and is build very well for how old it is..
Why was this important and what did it do. BY saying this I mean how did it help people and why did they build it to dom that. Look at what I should divide by to figure out my models length and height. Pharos, Alexandria, Egypt is where this amazing lighthouse is located. The lighthouse was constructed in the 3rd century BC. After Alexander The GReat died of a fever at age 32. It took 12 years to complete. It was built for a final cost of 800 talents, and served as a prototype for all later lighthouses in the world. The light was produced by a furnace at the top and the tower was said to have been built mostly with solid blocks of limestone. How could my diagram be better and how could this lighouse still be working if nobody destroyed it? So if it was still working would it be better or worse than a average lighthouse right now. In this time. I decided to make my passion project on minecraft because then I could make a diagram on the Alexandria light house and it's architectural geniuses. Plus it is super old which makes it even cooler. I mean for building it in 800 B.C. It must have been like building the pyramids of egypt except they were making the lighthouse for money. Plus it is very big. Like I made it in my diagram. For diagram I divided everything by 4. So that it would look the same, but be much smaller. This is a link to our Google Doc, there is a test on so please don't cheat. He was a famous Scottish war hero. He was one of the first people in Scotland to rebel against England. His rebellion was almost successful but he got captured. We want to learn more about him. We want to see if we can teach others about him. Looking at several different websites. We learned about the battle of Sterling Bridge. We learned he was born in France. We will teach others about him. We will create a Google Doc and a test at the end. 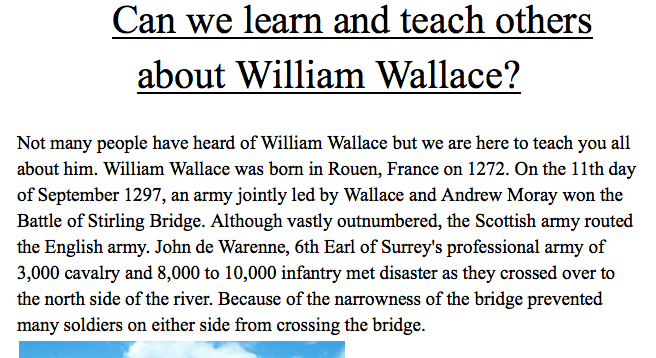 Who was king of Britain when Wallace fought Britain? 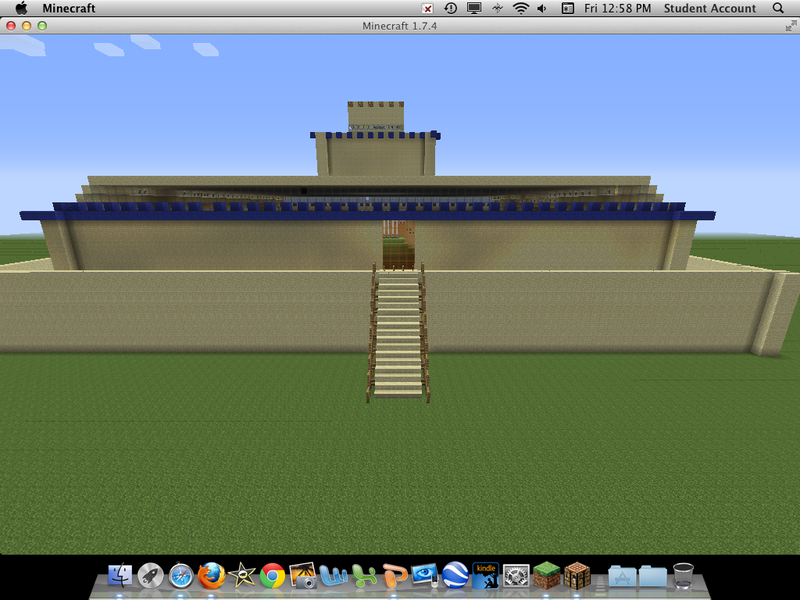 I had fun doing this project because love learning about history especially medieval history. I learned a lot like: Where William Wallace came from what made him want to fight plus his strategies and much more! Not only did I learn historical facts but I learned how to use google spread sheet to make a test and I also learned how to use the website that we used for grammer tests. I thought it was very fun creating the test on the google spread sheet but unfortunately we couldn't use that one and resorted to the website that we use for grammer test which is just a test making site but that's how I remember it. I learned so much and I think that this was the most valuable passion time I have ever had and by far the most fun because I learned about my passion time and about technology I haven't used before! Sean's reflection: I learned a lot about William Wallace that I never knew before. It was really interesting learning all of the new facts especially that he was born in France! I would have never guessed that he was, I thought he was born in Scotland because his rebellion was in Scotland. Before we researched I barely knew anything about him at all but at the end of the project I knew a lot about him. Also I learned about the battle of Stirling and William Wallace used a really interesting battle strategy to win. This is a picture of my website. Please check it out by clicking on the image. The people had different jobs like jesters and cooks. The castle had big walls surrounding it. The castle had guard day and night. What more jobs in a castle were. Details of all the jobs in a castle. The outside walls are meant for defensive purposes. The king is the army leader but does not have total authority. The army militia didn't always fight. They worked too. How was the castle like one big society? Why would they have the castle that big? If the knights weren't always training or fighting, what jobs would they do? I think that this round I learned a lot about castles. I never really knew a whole lot about them and they have always interested me. So I decided that doing this for a passion time round was a good idea for me. I think that life in castles was very busy and a lot of stuff was going on at once. It was very interesting to find out all that about castles and life inside them. So that's why I think that doing this for a passion time round is a valuable experience. How are basketball superstars different today then they were in the past? - Charlie Sc. and Luke D.
This is our website. CLICK ON IT! We know that the player have change of over time. We want to know how they have changed over time and if it was a lot or a little. We will look on the web and evaluate abilities and were they shoot from. We have learned that the players that we picked are very different. Some are old some are young. The players were sort of taller back then. We explained the differences in the past and the present players. They are different in a few ways. We want to know if there were any other really good centers like Wilt Chamberlain. I think it was really fun. I liked how I did something with my friend and I used basketball. We did a lot of research and we watched some videos. I learned a lot of players stats and answered a question that a lot of people ask. I liked the videos we watched and I disliked how for the facts we had to switch back in forth for the different people. I know that kid get treated different because of thing they have. How are people changing thing and will thing get better. Reading books and find the answer. I learned that bulling is not the right thing to do and if it happen stick up and get and adult. I will tell people not to bully it is not the right thing to do. 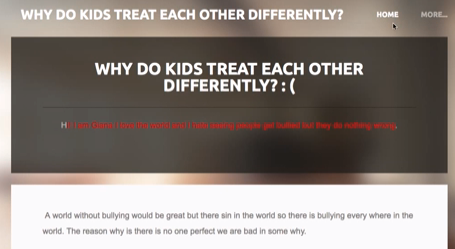 I want to know why do bullies are treating kid that wat. I learned that people are treating people differently just because of problem they have or what they where. Bulling is done in many different ways. One of the most painful aspects of bullying is that it is relentless. Most people can take one episode of teasing or name calling or being shunned at the mall. However, when it goes on and on, bullying can put a person in a state of constant fear. Bullies are at risk for problems, too. Bullying is violence, and it often leads to more violent behavior as the bully grows up. It's estimated that 1 out of 4 elementary-school bullies will have a criminal record by the time they are 30. Some teen bullies end up being rejected by their peers and lose friendships as they grow older. Bullies may also fail in school and not have the career or relationship success that other people enjoy. This was our third round of Passion Projects this year. If students hadn't already done a project dealing with the Arts, they were encouraged to do so this round (but not required).